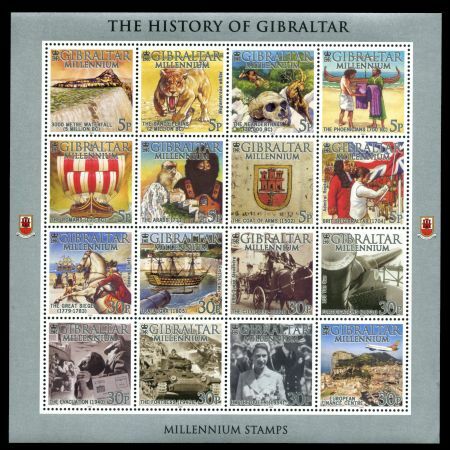 Gibraltar 2000 "History of Gibraltar"
Miniature sheet of 16 stamps depicting the history of Gibraltar going back to 5 Million BC when a huge 3,000m waterfall dumped water from the Atlantic to form the Mediterranean Sea. Two stamps and two mini sheets are related to Paleontology are: The Sandy Plains (2 million bc), depicted Megantereon whitei and The Neanderthals (30,000 bc). Note: This page is incomplete, some info is missing. In case you have the missing info please email to me.